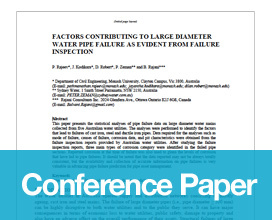 This paper presents the statistical analyses of pipe failure data on large diameter water mains collected from five Australian water utilities. The analyses were performed to identify the factors that lead to failures of cast iron, steel and ductile iron pipes. Data required for the analyses such as mode of failure, causes of failure, corrosion data, and pit characteristics were obtained from the failure inspection reports provided by Australian water utilities. After studying the failure inspection reports, three main types of corrosion category were identified in the failed pipe sections. Reported corrosion at the time of failure was also used to glean the levels of corrosion that have led to pipe failures. It should be noted that the data reported may not be always totally consistent, but the availability and collection of accurate information on pipe failures is very valuable in advancing pipe failure prediction for pipe asset management.